Angkor, the former capital of the ancient Khmer Empire, is one of the greatest and most spectacular Hindu religious sites in the world. Construction of this elaborate temple complex began in AD 802 during the reign of King Jayavarman II and was completed in 1432. The most famous temple, Angkor Wat, features an elaborate, unmortared 65-metre (214-foot) central tower surrounded by four smaller towers. Stretching around the outside of the temple complex is an 800m-long (2625ft) bas-relief, the longest in the world. This is Cambodia's most iconic sight, and particularly popular at sunset among tour groups. The temple is so synonymous with the country that it dominates the national flag, and to visit it today is to marvel at the scale of its ambition, built as it was in the 12th century. 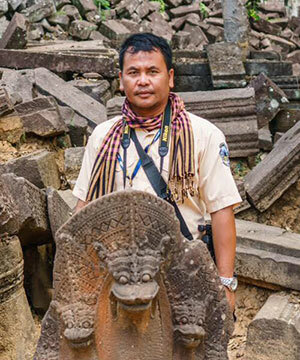 The Angkor Tour Guide, Siem Reap is a professional tour guide fully licensed by the Cambodian Ministry of Tourism. For the past ten years The Angkor Tour Guide is providing outstanding and reliable services to visitors from all over the world. Their superior knowledge of Angkor and the surrounding area of Siem Reap Province sets them apart from the rest. Join Angkor Tour Guide for an unforgettable, first class tour of Angkor and its truly amazing history. Your memories are just as important to us as they are to you. 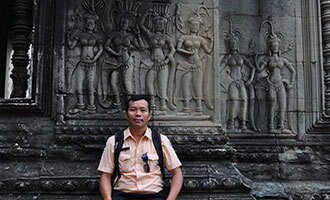 My name is Piseth ( Peter ), I am married with two children, Pitou and Vityea, I live in Siem Reap (Angkor Wat), Cambodia, where I have been working as an English and Spanish speaking tour guide for the last 14 years. Many of you will be visiting Siem Reap and Angkor Wat from different parts of the world. My services as an experienced licensed tour guide can be made for you during your visit to learn about Angkor Wat, Angkor Thom, Ta Phrom, Banteay Srei, Tonle Sap Lake, Phnom Penh and other sites you may wish to see during your time with us. I will guide your tour and arrange your itinerary. If you are planning to come to Siem Reap, you are welcomed to contact me to plan what will certainly be a wonderful and unique visit ! Appropriate attire when visiting temples in Angkor Wat is long pants (covering the knee) and shirts that cover shoulders. Skirts, small shorts, tank tops, and other items of revealing clothing are not allowed within temple grounds. Visitors can and are frequently turned away from temples when wearing revealing clothing. Mr. Senghuat Boun ( Huat ) Chum Reap Suor! My name is “Huat”. I was born in Siem Reap Town which is only 6km from Angkor Wat. Since I was at school I am really interested in histories and cultures and I thought one day I would get a job related to these. My dream became true! I was lucky in 2008 that I had an opportunity to attend a Training Cource as a tour guide in Angkor Archaeological Park by the Ministry of Tourism in Cambodia. Since then, I have got a chance to meet tourists from around the world. I have been working as a tour guide for many years. So I really understand how to arrange various itineraries to meet the needs of tourists from a short trip to a longer one. So please contact About Cambodia Services to help you arrange your trip in Cambodia unforgettable. 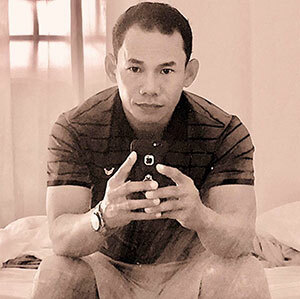 I am a co-founder of About Cambodia Services in purpose to serve you from heart. I hope to serve you soon !